Don’t let the fuzzy ears fool you. 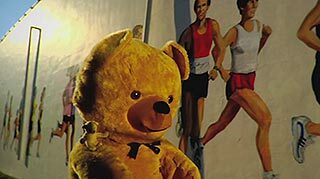 A cuddly teddy bear strolls through the mundanity of suburban living until he snaps in the most interesting — and completely disgusting — of ways in the disorienting short film The Sleuth Incident by Jason Kupfer. Filmmaker Jason Kupfer, who is a remarkable visual stylist, is about to begin production on his latest short film, M Is for Masks, and is raising funds via Indiegogo to make it happen. The Atlanta Underground Film Festival gave awards films Modern Love Is Automatic; Attackazoids, Deploy!! ; The Sleuth Incident and two dozen more movies. The 3rd annual Sydney Underground Film Festival will roll on Sept. 10-13 and feature films by John Waters, Clint Enns, Leah Meyerhoff and more. The 2009 Atlanta Underground Film Festival is screening The Man Who Would Be Polka King, Random Lunacy, Modern Love Is Automatic and more. The 10th annual Boston Underground Film Festival is screening Altamont Now, Hank’s Auto Repair and Westsider and holding a Leah Meyerhoff retrospective.